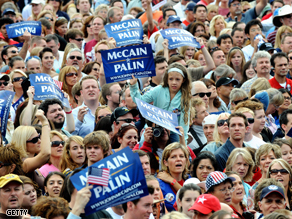 Stop the nonsense and call them "white voters"
Supporters of Sarah Palin at a campaign rally on Saturday. Can we just call white voters white voters? OK, I'm not trying to be the race guy, but these labels are driving me nuts! Earlier today CNN aired a piece on Joe Sixpack, and not a single African American, Hispanic or Asian was interviewed. Now, do these groups drink six packs? Yep. But don't we know that Palin isn't talking to them? Yep. So why not just say it? We even played a soundbite of Palin saying Joe Sixpack and hockey moms. Trust me, she's not speaking to anyone who looks like me! But there are other terms that have been thrown around by candidates, political strategists and the media, and no one wants to be honest as to who we are talking about. Wal-mart moms. Soccer moms. NASCAR dads. Small town America. Seriously. Read all of those phrases, and when you think of who candidates, political strategists and the media are talking about, who immediately comes to mind? I can tell you no one black, Hispanic or Asian! So, can we just stop the nonsense and say, all at once – WHITE AMERICANS. I just think it's so obvious, but it as if we – the collective media – just doesn't want to say it. But to further explain the Joe Sixpack stuff, I saw an interview on American Morning with with Jackie and Dunlap, two redneck comedians. So essentially we're going to two country white guys to define Joe Sixpack. Need we say anything more as to who Joe Sixpack is? Now they were hilarious, and I love 'em – got Larry the Cable Guy and Jeff Foxworthy on my iPod – but it's as if the white elephant is in the room and we close our eyes and act like it's not there. See, if we're discussing black, Hispanic and female voters, we just say, "black, Hispanic and female." But we try to be cute and not say what we really mean. Lastly, can someone tell me the last time you heard McCain or Palin say inner city? Maybe those aren't the voters they care about. Obama is white and black, so how can blacks play the race card or cast a racist vote. You obvious hav'nt been around black people before. Blacks are not ignorant. They helped build this country. It's people like you, Sarah Paling and John MCcain who will finish tearing this country down, and when that happens, there will be no place to run or hide. OK, first of all, I am a white woman who lives in a small town in Indiana and yes, we sometimes have a six pack around our house. Supposedly I am exactly who Palin/McCain stand for. Let me tell you right now I am NOT who they represent. I am voting for Obama because he has a plan for this country to get us out of this mess that electing the last "Joe six pack" got us into. Personally, the fact that Sarah Palin likes to point out that Barack "isn't like us" , like that's a BAD thing is scary. I want someone who's not like us...I want someone smarter than the "average Joe" running the country. Maybe I'm crazy but my biggest fear is that people will ignore what Obama stands for because they can't get past what he looks like. If this happens, it will be a tragedy and I can't imagine what will happen to this country if McCain/Palin are in the white house. On the post debate show last night one of the commentators said that racial issues would probably reduce Obama's votes by 6% – how was that number arrived at? That really disturbs this white voter. That would mean that Obama to have a real lead in the race will have to maintain a percentage lead of over 6% plus the margin of error. So with this in mind is this still the close race it was? Does Obama really have a commanding lead now? And if he does, why? If you dont want to be the race guy, then stop being racist. I read articles stating that people who dont plan to vote for him are racist And I hear that if he doesn't win its bc whites are racist and wont pull the lever for a black man once they're in the privacy of the voting booth. For someone who is supposed to transcend race, Obama certainly seems content to allow people like you to use it to your full advantage. I hate to break it to you, Roland, but white people don't care if Obama is black, they care that hes completely unqualified to run this great country of ours. None of the white people I know care if someone is white, black or purple; but it sure seems like you care about skin color, especially if you can use the race card to make people feel bad for not supporting your cause. If anything, the media won't call black voters black for fear of being LABELED racist. And I'm quite certain that McCain/Palin aren't mentioning the inner city voters b/c they're not even bothering to target them; they're smart enough to know that most inner city people are voting for Obama. Why? Because hes black; it sure isnt because hes qualified. why is it that some people out there are mad because blacks are voting for oboma ho happens to be a dem 90 percent. and calling it raciest. blacks have been voting for white people 90 percent of the time that happen to be dems. well all ways vote dem. what have the GOP dun for me. by the way I am a 25 year old black man that did my part in the united states marine corp. and fought as a grunt in afganistan. I have put country first. and I am going to do it again my voting for oboma. not because he is black. but because of what he stands for. Race only matters when Obama is trailing in the polls. When he's ahead, no one...not even Roland questions the black voters who are simply voting for Obama because he's black...and there are more out there than Roland wants to admit. But when he trails in a poll, all of a sudden people like Roland question' How big of a factor is race"
If Obama wins this election, there will be no mention of the millions a black 'Racial votes", but if he loses, the "White racist" vote will be in the headlines for weeks. As much as I disapprove of Sarah Palin as a VP choice and McCain as a president, and am so turned off by their sleazy smear tactics, I don't think Joe Six Pack symbolizes white voters to them, and if it does then they do many of us white voters an insult for I am not one of them (Palin/McCain, nor a Joe 6 pack nor a hockey mom, nor a Republican, and I am a strong Obama supporter). I think the whole Joe 6 pack comment, which if you noticed came after she was made to look uneducated and uninformed, if not a bit stupid by her interviews, so I think she was more trying to get the vote of people who know they wouldn't get into to Harvard like Obama, or be lawyer like him and Biden, but that might be a housewife or a military man, or a joe 6 pack working a 40 hour a week blue collar job. I think she understimates those people for they still want smart educated people running the country, even if they don't understand the economy or know much about Sunni vs Shia, they sure want our President to know that stuff so he/she runs our country properly. To me, she was saying okay so I am uneducationed, uninformed and a little bit like the Tina Fey impersonation, but that makes me like the majority of Americans that don't go to Harvard, that don't stay up reading magazines but kick back with a 6 pack and watch TV... and yes they want a drink with that person but after Bush lets hope that demographic doesn't want them to run our country! I would love to see the day that we are all just Americans, no labels about ethnicity or about what part of the country we live in. Just as it doesn't matter what color our eyes are, how wonderful it would be if we all thought of each other as Americans and not by any other standard. Pretty sure it won't happen in my lifetime, but maybe if everyone put forth an effort to stop using all the labels that divide us and just called us all Americans, it could happen someday. Maybe it could start with you. You have exposure to so many people that if you called other people for doing it and stopped doing it yourself, maybe we could speed up this much needed change. Roland, I am white and 56. I am voting for a pathway to healthcare and energy policy, a step towards education and sensible tax policy. I am worried about the economy and the future. The Black, Hispanic, Asian, and Arab people that I know are all concerned about the exact same things. Race does not really divide us in this election unless we choose to let it. The Republican campaign and the press do use code words, including "risky" and questions ike "do we really know Obama?" Trying to turn Obama into a scary guy is a direct appeal to ignorance and fear. It seems like a pretty narrow demographic . Is there anyone running that campaign? I feel the race card started, not with the McCain camp, but Obama’s. It started when every supporter of Obama’s said that if you did not vote for Obama you where raciest. I am a white voter and I am not voting for Obama not because he is biracial but because he is not qualified to be president of this country. He lacks experience and judgment and I feel he is not the man to pull us out of the crud we are neck deep in now. He might be a fine speaker, but his spell has not worked on me or many that I know. And to all of you who think he knows where you are coming from because he grow up poor, you might think twice, he might have been poor at on time but no longer. and if you think he will help you now you are mistaken, do you really think he will raise his own taxes and not yours, and if you do might I ask what color is the sky in the world you live in? Yeah..that sounds just about right. The campaigns could go with more ambiguity and call everyone "Americans". I've said it before and I'll say it again – ENOUGH with the cute stuff. Particularly on the McCain/Palin side. I know, it's supposed to be refreshing and "energize" the base, but we already have a president who fumbles during his speeches/interviews; coincidentally, he also winks too! I actually like Palin and I think she makes a great local politician, but I can't take her seriously anymore. Americans need reassurance that we will have competent leaders this January 20, 2009 interested in restoring credibility to Americas reputation. I don't think overusing the terms "maverick", "joe six-pack", and "soccer-mom" are doing American's any justice. The whole McCain campaign has become somewhat irresponsible and chose the wrong timing to do so. Moreover, the cute, folksy, white-talk demonstrates Palin's lack of experience when it comes to relating to every type of voter. Thanks for pointing it out Roland. P.S. Rowland, I also think that all news stations need to stand up and not support such dangerous coverage of Palin. They also need to address McCain's racist behavior along with his poor VP pick. On the debate last night, Obama attempted to shake his hand and McCain walked away and failed to extend his hand. Now, is that the type of behavior that you would want your children to display. McCain is so childish and old but immature. SAD!!! Can you imagine him in the White House with these behavioral issues? His behavior would keep us at war. I mean it. We would STAY AT WAR!! I am also sick of his POW story, you know i am a veteran but I don't go around begging for recognition. You serve and do it with honor and when it is over it is OVER!! MOVE ON! I was a Dem,but not now after the way the DNC has been so corrupt,I believe McCAin is the best for our president because at least we can trust him with our country and know we will at least be safe,if Obama gets in I'm not sure any of us will be very safe because he wants us to be a socialized country,listen to his health plan,the way he wants to do taxes,and for gods sake he knows nothing about the militay or the war,if we listen to him we will all get killed,I have several members in the military and my husband was in the secret service and they all say we can not let Obama in because he would be very bad for the military and this country-Thank god most all of the military is for McCain. What do you think of someone that wants to change our flag,our national anthem,our pledge allegiance,our presidential seal,heeven had the American Flag taken off his plane. I never thought of it that way but you are EXACTLY right! The cheesy things Palin says make me sick as a white woman. She does NOT represent my views! P.S. You are the coolest aggie I know except for my deceased brother in law who played 4 years football @ TX A&M then got his doctoral form A&M and taught there. Gig 'em Roland! Living in Mississippi for 6 months this past year, I realized that the mentality of the white versus the black debate didn't end after the Civil War or the Civil Rights Movement. There are still unofficial black and white gas stations, unofficial black and white neighborhoods and unofficial black and white schools. To say otherwise, it is just naive. Anyway, the Joe six-pack is an unofficial way to reach the stupor of hot-headed, un-motivated angry white men and women. When angry, blame someone else; when cornered, start swinging; when facing job loss, blame the unions; when taxes are high, blame the minorities. Just pull up your boot straps! Joe Six-Pack doesn't have a clue. Yes...you nailed it. I agree. Finally, someone has the nerve to confront the elephant in the room. Rahni in Conn. calls McCain a racist for using the term "That one"? I use that term all the time talking about other whites, so it's not the racist term you are trying to make it out to be. Remember just a few short months ago, Obama refered to his own grandmother as a "Typical white woman"! I wonder if Rahni was just as offended by that comment or if her accusations of racism are selective. Personaly I would consider "typical white woman" more of a racist comment than "That one"
I wasn't able to get online during that time, but I also wonder if Roland wrote on his blog negative comments of Obama's "Typical white woman" comment, or if he had a list of excuses as to why he said it. You see, it's frustrating that you try to make everything McCain and Palin say out to be racist, but it's even more frustrating that you don't have the character to admit when Obama does the same. But it's something we've all gotten use. After hearing david Gergen say last evening bringing up the race issue about Barack, he has got to go!! I'm a white 69 yr old white woman from the south and it is time the pundits realize this is a New World we live in. 10 yrs. ago race woud have been an issue but not today. Barack is ahead in all the polls and will be our first black president which we should all be proud of. I watched the debate last night. I am neither Democrat nor Republican. I am one of those darn Independents. I was absolutely floored by the blatant condescension displayed by McCain, not only to his opponent, but also to the audience. I do not know how many times he said "my friends". My thought was " You do not even know me, we are not friends". How can a Washington that is so out of touch with the average American, one who does NOT have 12 homes and millions, call me his friend? I was also shocked by the analysis after the debate when Gergen brought up the obvious problem with Obama is that he is black. Does the color of one's skin negate all other aspects of a candidate? I am so appalled by how that comment was taken and validated. However, let Obama use the race card and he would have been lambasted. America when we see that we can not get to where we should be unless we get there together. Getting to know people different other than ourselves, so that we can become real friends. Race is a huge issue in this election. The latest polls show that over 97% of all black voters support Barack Obama. Voting for a candidate based on race is no different than voting against one. I am still undecided and basing my decision on the issues and facts as well as my personal beliefs. I will weigh these factors against those of each candidate and choose the one that represents me. I can only hope everyone else does the same. But, I do not believe that everyone voting for McCain is a bigot the way it has been implied. Roland, I suppose creating code words for other ethnic groups wouldn't solve the problem for you. The media wouldn't touch Old English Tyrell, Sake-san or the Tequila Bandito with a ten foot pole. Joe Six Pack is not just about hiding the obvious albedo implicit in that term. It highlights a serious division in the White population that this campaign has exacerbated. It shows that the McCain campaign has already written off the Cabernet and Chardonnay Caucasians. The Ayers smear is proof of the pudding. Is Obama accused of "palling around" with contemporary problem children like Mummia. No, it's a lily-white "terrorist", "shamefully" rehabilitated by a pack of urban liberal elitists. This time around Willie Horton is white. I agree with you Rolland. If Obama were not black he would be at least 20 points ahead in the race. In spite of the secret racists, McCain is such a joke and Palin an idot, the american people want a change. I'm voting for the man. I grew up in the deep south, am a 62 year old white male and I care about my country. I'll admit I would never vote for someone like Jesse Jackson, but Obama is different and people need to see that difference. He has a very compelling story and will lead this county instead of the current Texas cowboy (I now live in Texas) and his sidekick McCain. I found Palin very offensive even before she went off the deep end with all the negatives and untruths. As most of you remember the Republician convention, several comments were make about you were hard pressed to find a delegate with anything other than white skin, but what bother me the most, the majority of the delagates had incomes over $250,000, the group McCain wants to give a tax cut to. If it comes down to race against Obama then I would protest against such nonsense. Who has the right to even say anything like that and why? Having such a close mind and being so ignorant why? If the same thing was said about white, hispanic, brown or asian people that they are close minded, ignorant and selfish people then everything starts at square one. Having such thinking shows the character of ppl who think this way. In all fairness I think this is absurd and should not be taken lightly in any sense. I think it should be looked into and there should be some sort of consequence for it. My husband and I love hearing Barack speak because we feel a sense of direction, mindfulness, thoughtfulness and even a calming aspect to his message. We are not 'joe six packs' or 'hockey moms'! In fact, this is a very narrow group of people to appeal too, but McCain and Palin don't understand that. In fact, it is a complete insult to us. We have real issues paying our mortgage and sending our kids to college and now healthcare issues. We are both 50 years old and we wonder if this is how people felt when they heard FDR speak his 'fire-side' chats during the depression and the years to come. We have a great deal of confidence in Barack and we can't wait to see him win on November 4! I am sad to see that McCain and especially Palin can only come up with slinging lies against Barack. Is this the best they can do? Neither of them have any room to talk since their closets are hardy clean. Palin with the bridge to 'no where' and 3 miles of road costing taxpayers 24 million dollars, the lawsuits in Wasilla for a recreation center that has a 'lean' on it, her association with a questionable church and her husbands activities with questionable groups. McCain with the Keating Five. Who are they fooling? They need to stop the craziness and get to the real issues. Unfortunately they are only tactical thinkers without a strategy or plan. Shame on them! I'm one of those fifty-something Hillary supporters who will without question vote for Obama, and proudly. I'm also white. And I think you can add another layer to the issue of race; in my opinion, with less than a month to go, after nearly 2 years of campaigning, anyone who is still "undecided" is struggling with whether they can vote for an African American. I listened to David Gergen's analysis last night after the debate, and agree with him. I also listened to your "undecided" voters and found much of what they said to be nonsense. Excuses. The candidates aren't specific enough? Go to their websites and READ. Listen. Learn. And who with any intelligence thinks that the specifics for the economy, healthcare, or any other major issue facing us can be laid out in 90 minutes? Most of the people in that room wouldn't understand the specifics anyway. Neither would I, for that matter. It's the issue of race, whether it's conscious or unconscious. It's all about race. If the six percent is the difference between a win and a loss then its important to get to those voters that think this way. This is exactly the kind of change that we need to resolve this type of thinking that is embedded in the hearts of the American people. If something isn't done to change it then history will surely repeat itself. Any decision that is based on hate and racism should be ignored completely or insured that the votes are strictly done in a way that it goes to the best candidate for the job. If nothing is done to change this now then later on nothing will be done to ensure that this doesn't happen again. Roland, I'm glad to see I'm not the only one who saw the KKK rallys that McCain and Palin hold. You should not be surprised when Palin's husband Todd was a member of a group called The Alasken Independance Party. He was a member until 2002 and she recorded a speech for their convention last march. And Sarah got the blessing of her pastor Pastor Thomas Muthee who would be a Domestic Terrorist in his homeland of Kenya, where in 1999 he said a woman in the villiage was a witch and tried to run her out of town, really nice people they hang around with, huh?....But they can talk about Obama and something that happened 20 yrs ago. Roland has no problem admitting Sarah Paling is targeting white voters, yet he refuses to acknowledge that blacks are voting for Obama simply because he's black. Why would she be trying to target black voters anyway. There's no way in hell McCain will win over black voters because he's a white man. Blacks I've spoken to don't know anything about Obama other than the fact that he is black, yet they are still voting for him. If that's not racist, I don't know what is. But Roland won't admit that his fellow black voters are casting the "racist vote". And before you just excuse me as a Republican...I'm not. I'm an Independent. I'm not sure if I'll even vote because I don't feel either candidate is right for the job, but I surely won't base my decision on race like so many blacks are doing. It would be refreshing if Roland could "Man up" and admit blacks are casting the "Racist vote"
The republicans have reached an all time low and are turning this nation against each other: middle class vs upper class; patriots vs terriorists; military vs non-military. Have we forgotten so quickly about 911 that put all these differences aside and we all Americans? I strongly support Obama. However, I'm really afraid that with all the economic turmoil, this Presidential race could drag this country back into segregation mindsets if the McCain/Plain ticket makes it to office. If that happens, I'm moving to Canada or England where I m more willing to take my chances to start anew. You are absolutely right. Race only matters to those blacks, like Martin, who are always playing the victim and want to continue to use it as a weapon against the white community in order to get what they want. Just an add on to my last post. First that I am a white male, so you can see I have no racial bias in my first comments. Second, to Cindy in GA, he said HOCKEY moms, not SOCCER moms, big difference. While I agree with some of your comments I do also agree with some posts here that you do pull the race card quite often. If you don’t think about race all the time and rather competence or the person’s value and personality we ACTUALLY may move past this issue. I’m a minority Indian woman and I refuse..absolutely refuse to acknowledge racism. I will not consider it for myself or any other. I portray myself as a person who is fair and competent and I judge others likeways. For those who aren’t like that and WANT to look at my race and judge me, then I have no time for a person like them in my life. Trust me I will succeed without them! So called “leaders” like her scare the heck out of me, because instead of elevating us and leading us forward, she is determined to pull us down back in the mud and erase all the progress that we have made and can make in the future. With her in any leadership power scares me of the intolerant views she will be promoting, and what kind of place would that be for anybody that doesn’t fit her conventional image? Hats off to you Roland and David Gergen (my fave) for taking on this issue, it is the big white elephant in the room; and thank you Greg for noticing what I also noticed with the focus group last night. I actually sent an email to AC360 asking them for some follow through. Why didn't Soledad O'Brian ask the focus group to explain the huge discrepancy between their reaction to Obama as being a positive on most talking points when compared to McCain, but the majority would still vote for McCain if the election were held today. For those of you who don't think race is an issue, this experiment with the focus group plays it out on live television with the dial testing. Roland, you are right on this one. Look at the stark difference between the 2 conventions. The DNC had a mixture of all colors, races, creeds. The RNC had 99% white people, many of them old. I don't know any Black hockey moms or Asian Joe 6-packs. I am a white female that lives in a town of 1,014 people. I thought "Joe six pack" was refuring to the beer drinking, white men of America. If you drink beer, Sarah is your girl. Should Joe Biden come out and say he is speaking to Joe micro brew? I need to e-mail SNL. While I agree with some of your comments I do also agree with some posts here that you do pull the race card quite often. If you don't think about race all the time and rather competence or the person's value and personality we ACTUALLY may move past this issue. I'm a minority Indian woman and I refuse..absolutely refuse to acknowledge racism. I will not consider it for myself or any other. I portray myself as a person who is fair and competent and I judge others likeways. For those who aren't like that and WANT to look at my race and judge me, then I have no time for a person like them in my life. Trust me I will succeed without them! Every time Sarah Palin said "Joe six-pack" I felt like saying, "I'm sorry can we modify your statement a bit and include the Juan six-packs, Lee six-packs, Patel six packs etc...or lets just make it easier and say American six pack...or wait wait let me make it EVEN easier and just say AMERICAN"
So called "leaders" like her scare the heck out of me, because instead of elevating us and leading us forward, she is determined to pull us down back in the mud and erase all the progress that we have made and can make in the future. With her in any leadership power scares me of the intolerant views she will be promoting, and what kind of place would that be for anybody that doesn't fit her conventional image? Roland, thanks for the common sense. Lets not forget the motto of the Commonwealth of Kentucky "UNITED WE STAND, DIVIDED WE FALL"
Attempts to categorize and compartmentalize is one of the long time tactics of the republican party. When someone asks me, I say "I'm a PERSON for Obama." Roland, i am an independent and have voted for George Bush Sr, John Kerry, Gore in the past. i was leaning towards McCain before 1.5 weeks ago but am now for Obama especially after McCain's comment that he viewed health care as a "responsibility." It is very easy for him to say that with his health insurance and rich wife since this present health care system is broken and i see it every day on the frontlines in texas as an internal medicine MD, primary care physician. health insurance coverage these days is becoming more restrictive and more about denial and shifting costs to the average american and the health insurance bobbleheads and their cronies call this americans becoming more "responsible" and accountable for their health care choices. Most unhealthy americans did not choose to be unhealthy or riddled with chronic and daily pain or diabetes and we need a system like OBama's proposal that will take care of Americans and prevent such hardship on the average american. Terrence- I understand your concern, but Roland is right to bring this issue up. Go back and read Greg's comments posted at 9:49. I was glad to see I wasn't the only person last night that was shocked when I realized, the "undecided" voters in Ohio said Barack won the debate, said every thing postive, but then, most of them said they won't vote for him! The reporters were taken aback. I think what you mean is "misguided white voters"...or just "stupid people"
If you go to a McCain /Palin rally, it is overwhelmingly white...just go to one and take a look. Sorry folks, there is just a racism issue at play here. There are 3 types of Republicans: folks who like to pretend that they have more than they really do, folks who are blatantly racist, and the very wealthy. It's completely unacceptable to insert race into every discussion about the various campaigns. Most Americans, regardless of race, want our country turned around and may question whether either candidate is capable to accomplishing said change. When people mention Joe Six-Pack, most think of a white male; when people mention rap music, blacks come to mind; Olympic sprinters? most likely Jamaicans come to mid. To use race for political purposes is unacceptable; to frame a political issue in racial overtones is trite; please move on and try to become more than a one trick poney. All the hockey moms and Joe six packs couldnt put McCains campaign back together again. They are preaching to the choir each and everytime McCain/Palin open their mouths. There should be no shock that they are behind. If they made a hard decision to never say hockey mom, Joe 6 pack and maverick on the stump for the next month, they might see that by speaking to the people as fellow Americans, it might just go a long way to solving some of the campaigns problems with people on the fence. I dont put much faith in the CNN voter reaction graph that was at the bottom of the screen during the debates. However, there were times when McCain's dialogue didnt register a thing from anyone, a flatline. Thats amazing. Obama always drew a reaction from the group. That says alot. Regardless of what he was saying, he got people thinking and reacting to him. David Gergen said there was no electircity in the debate, and he is mostly correct. But there is no denying Obama creates his own electricity whether you like his message or not while McCain just simply creates nothing in people who are on the fence toward him. I know you are an educated guy, that's why I'm always so disappointed when you are so divisive. Every ninth time you speak you bring up something interesting or smart, but those other eight times I just wonder if you realize how much you hurt your cause. Roland you are certainly right, glad your not afraid to talk about the race issues. When was the last time you been in the "inner city" because there ain't no black soccer moms where I stay. Now I am sure there are a sprinkle of black folks that live in the surburbs that are at a soccer game but lets be real. When Palin talks about "6 pack Joe" & "hockey moms" she ain't talking about us colored folks. That is why 99% of black folks vote Democrat no matter if the person is black or white because they are the only Party that actually acknowledge we exist. Roland I hear but we all know that race will always matter in this great country! I just find the "joe six-pack" a racial remark that is geared to suggest the blue-collar, uneducated, skin-head, KKK, red-neck and I am sick of hearing about it from her. She is insulting to the hard working, middle to low income Americans like me. Is there not enough alcohol and drug abuse in our society to go around due to stress and economic pressures? It is a social issue that needs funding for programs to help alleviate the epidemic. Not a club at the hockey rink! With all respect Roland, I don't know that they really are referring to "white people"... they certainly aren't including me. Maybe they are referring to "some white people" or "uneducated white people" or "white people who live in small towns" or "rednecks" but whatever they really mean doesn't matter to me. It's not inclusive of me (although I have been a republican for many many years) and despite the color of my skin (which is white) I'm voting for the person who is more like me... Barack Obama. Like me Obama believes in inclusion not exclusion. Like me he believes in the word "we" not "me". Like me he believes to help another is to help all. So let Sarah rant about sixpacks, hockey moms, small town america, I'll tune her out because she's not talking to me.